Recently a new show appeared on my Netflix recommendations and drew my attention. Dark Tourist sells itself as a provocative and quirky documentary series, in which New Zealand journalist David Farrier visits sites associated with death, disaster and atrocity. He seeks the “mad, the macabre, the morbid”. From meeting one of Pablo Escobar’s henchmen in Colombia to participating in funeral rituals in Indonesia, each episode spends a few minutes at a site, before swiftly moving to the next. Its jaunty theme tune and Itchy and Scratchy style title credits set the tone. Based on my research in Cambodia, I argue that Dark Tourist pursues a reality TV aesthetic for entertainment but achieves little to further understanding of past and present atrocities, or why people visit such sites. Focusing on extreme tourist destinations in places determined to be off the beaten track, the series is riddled with words like bizarre, wacky, bloody and macabre. In an interview about the series, Farrier sells the show as being about “all these strange people in all these strange places doing strange things. By situating it as such, the destinations are presented as peculiar places, the people who run them somewhat abnormal and those who visit as slightly deranged. Glorifying the danger of the locales, and highlighting the “bizarre” nature of the encounters, Farrier is portrayed as some kind of rational, moral explorer hero visiting little known people and places and exposing the realities of each site. By centring the series on the idea of abnormality, the show fails to try to understand the wider socio-cultural and historical context of why people do these things, or visit these places. This is a new version of the freak shows of earlier years, but here the freaks are those who see economic potential in commodifying sites of violence or death and those who want to visit them. The trend is posited as particular to our age – a morbid aspect of 21st-century global tourism. Dark tourism is not a new phenomenon, nor is the use of artefacts of violence in pursuit of economic or political capital. People have always been fascinated with sites of death and disaster, and others have always exploited that. In the Middle Ages the Catholic Church encouraged contemplation of death and dying through viewing memento mori – often displays of skeletal remains. During the Napoleonic wars, British tourists visited the battlefields to watch the fighting. Teeth, bullets and other material artefacts were collected and sold afterwards. The Egyptian pyramids (most of which are tombs) have been a tourist destination for decades, and mummies have been displayed in museums around the world for more than two centuries. Some 20,000 people reportedly watched the last public hanging in the US. As part of my research in Cambodia, I consider dark tourism, particularly in relation to Khmer Rouge sites, but also in the wider tourist circuit of Cambodia. Part of this research examines why people participate in the commodification of their own, often harrowing, histories. I also explore the attraction to tourists of such sites. Dark Tourist does little to examine the motivations behind such commodification. Instead, the show positions it as either cynically economic, political, or just plain absurd. There is truth in the idea that in order to attract visitors, sites have to conform to an international tourist aesthetic. They also have to present a particularly salient political narrative, which obscures alternative understandings, and may bear little resonance with local ways of dealing with violent histories. However, as my research shows, this is in no way weird or unreasonable. Many of my research participants saw tourism as a means of connecting Cambodia to the wider global community, and so ensuring its position in networks of support for the future. Others considered it an important means of education, both for the tourists and for their own communities. All were aware of the political motivations for certain commodifications and the simplification of stories presented by others. But they considered this less important than the imagined positive results of tourism, directed towards a more stable future. Tourists also came with a plethora of motivations. While this series suggests voyeurism or thrill-seeking is the norm, this is actually the minority. The main attraction of dark tourism sites is their material and emotive connection to particular histories or violent events, particularly where they are within living memory and have impacted globally and locally. My research shows, for example, how the display of human remains and exposed grave pits at Choeung Ek Genocidal Center, colloquially known as the Killing Fields, offers an affective connection to the Khmer Rouge. It collapses time by re-imagining the horrors in the present through the tourist encounter. For those visiting funeral rituals or other contemporary treatments related to the dead, it is about experiencing alternative understandings in the present. The increase in dark tourism does not, I think, reflect a growing morbidity or fetishism of death and atrocity. What it does reflect is a liberalising, globalised economic system where tourism is increasingly a major economic sector for many countries. It is also, I believe, a reaction to the increasingly precarious and seemingly insecure world we live in. Of course some people visit such sites as ways of increasing their social capital: providing a means of presenting themselves as adventurous and brave. Hence an increasing number of sites appeal to extreme pursuits, such as the shooting range the series visits in Cambodia. 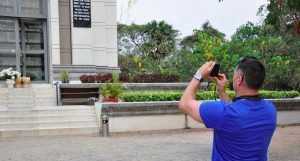 But for many, visiting sites of atrocity or disaster provides a connection to events they have learned about but not experienced. The sensationalisation of Dark Tourist conforms to a reality TV aesthetic where ever more extreme experiences are pursued in the name of entertainment (think Survivor). This positioning does nothing for helping understand the context and impact of these tourist sites, nor the people who live and work in these realities. While Farrier is stepping out into the no-go area of Fukushima (and putting his tour guide’s job in jeopardy), or investigating the “lawlessness” of Alexandra, South Africa, in the name of impactful television, there are people for who this is their everyday life. Although Farrier is worried about his few minutes of exposure to radiation, his tour guide Yo and a guard about whom he remarks “if job satisfaction comes from getting rid of people like us, he should be a happy man”, are exposed to this everyday. The people of Alexandra are living with the ongoing legacy of apartheid and ongoing tensions in South Africa. Reclaiming their future through participating in the commodification of dark tourist sites is a means to make a living, and perhaps reassert some control. It is neither weird, nor extreme, to attempt to understand a violent past better through material connection. Written by Caroline Bennett, Lecturer in Cultural Anthropology, Victoria University of Wellington. Disclosure statement: Caroline Bennett received funding from the ESRC and Victoria University of Wellington for her research in Cambodia.